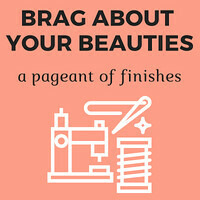 My approach to posting here on From Bolt to Beauty has been simple. 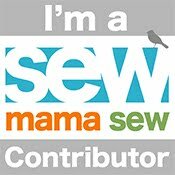 I figure, if I post well-written content, inspiring projects, and tried-and-true tutorials and techniques, quilters will read. I am thrilled with the traffic my site receives and am thankful for the community I’ve found here. My husband, who neither blogs nor quilts, argues that I haven’t tapped into this site’s full potential. He has his own theory about growing my readership, one that has nothing to do with my let’s-learn-together attitude or the quality of my pictures. 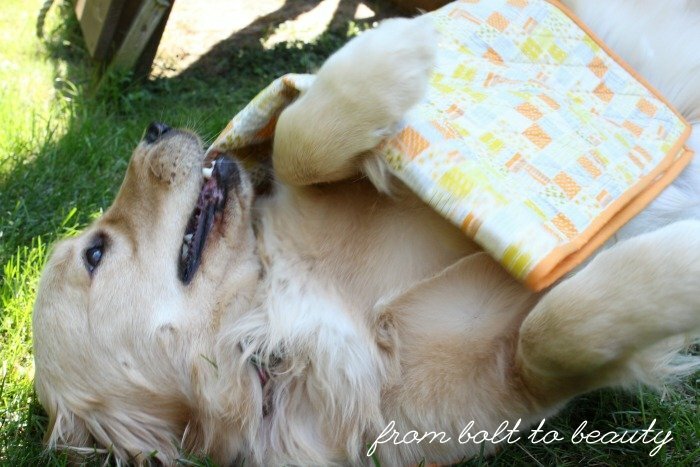 His strategy for From Bolt to Beauty can be summed up in one word: puppies. After all, what do quilters and nonquilters alike love? Puppies! 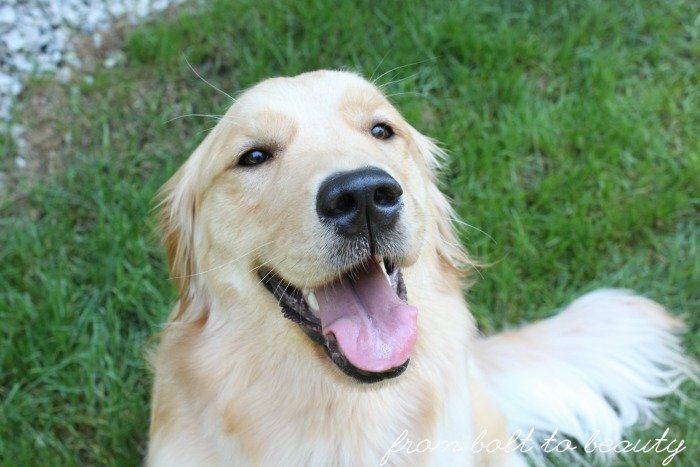 What makes everyone smile? Puppies! What’s better than quilts? 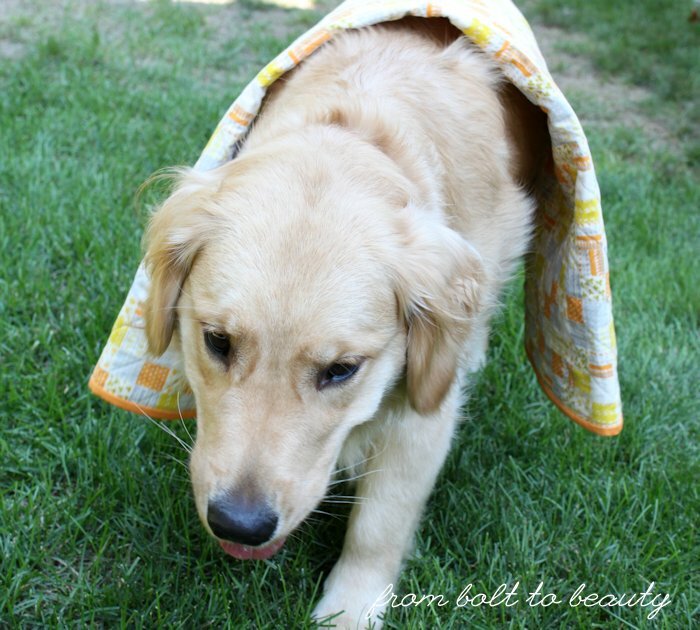 Quilts and puppies! Rose is no stranger to FBTB. She debuted here in September 2015, when I revealed the hazard she poses to my quilts. (See Rose, Textile Enemy No. 1.) When my husband caught wind of Pets on Quilts, an event hosted by Lilypad Quilting, he knew it was time for Rose to make another appearance. 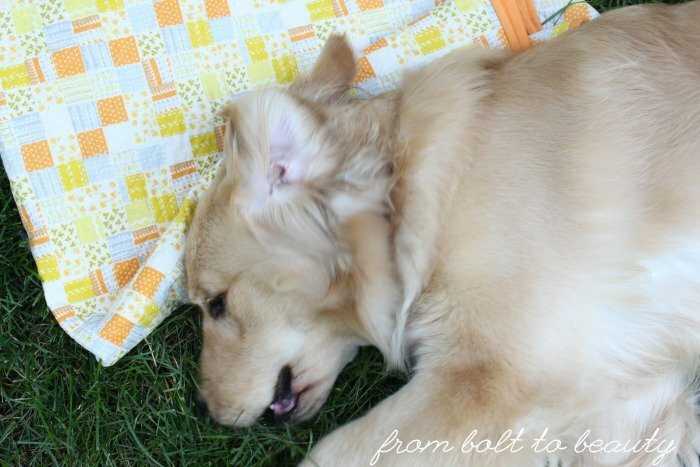 Mom, is this good enough—a pet next to a quilt? Here was the closest I could come to getting my pet on a quilt for a picture. It was a fleeting moment and was followed soon thereafter by Rose ignoring the quilt and eating grass. Sigh. Is my husband on to something? I’m not convinced. 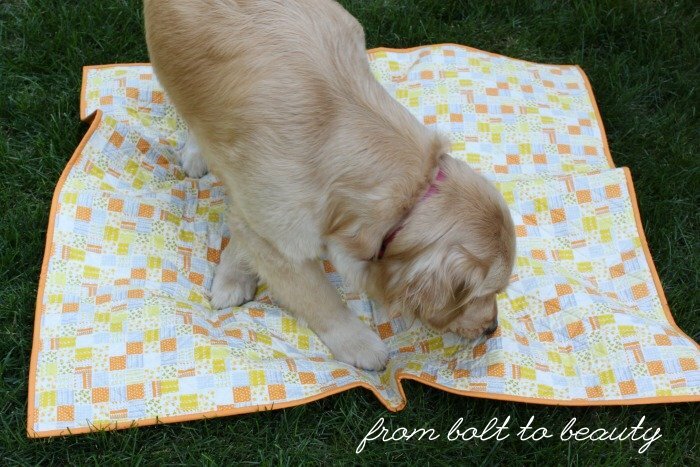 My next post will have less puppy content and more quilt content, for sure! That’s why I’m happy to reveal these two projects. They’re not derivative. They’re not inspired by. They’re 100% swiped from Nancy Purvis’s Instagram feed! 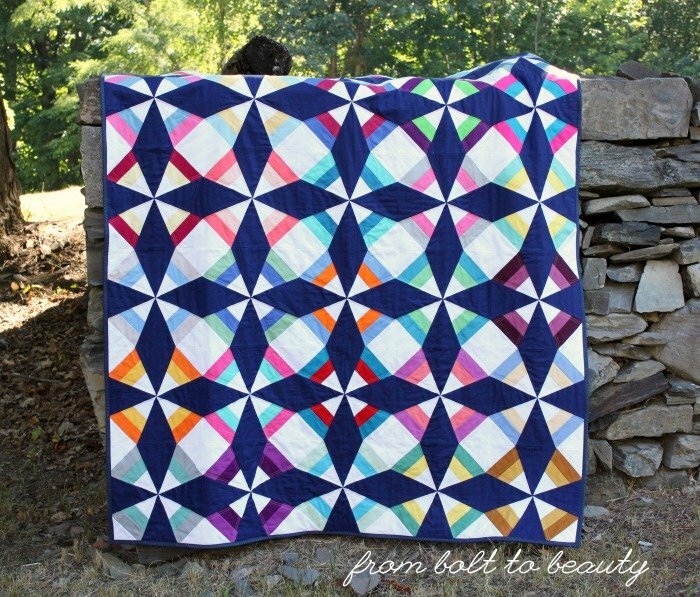 You may know Nancy from her blog, Owen’s Olivia, or from her book, Quilting from Every Angle. She also showed several quilts at QuiltCon 2016, earning a ribbon for Reflection. Nancy’s designs are fresh and modern. The first is a project slated to use up the Carolyn Friedlander/Botanics scraps from my Park Bench quilt. I’ve been using a rotary blade without a ruler to cut these scraps into straight-ish strips, sewing them back together with some Kona Silver, and squaring up the blocks. (You can see Nancy’s own projects along these same lines here, here, and here.) This quilt, after just a few completed blocks, is now on the back burner. I look forward to making it a priority again before the end of the year. 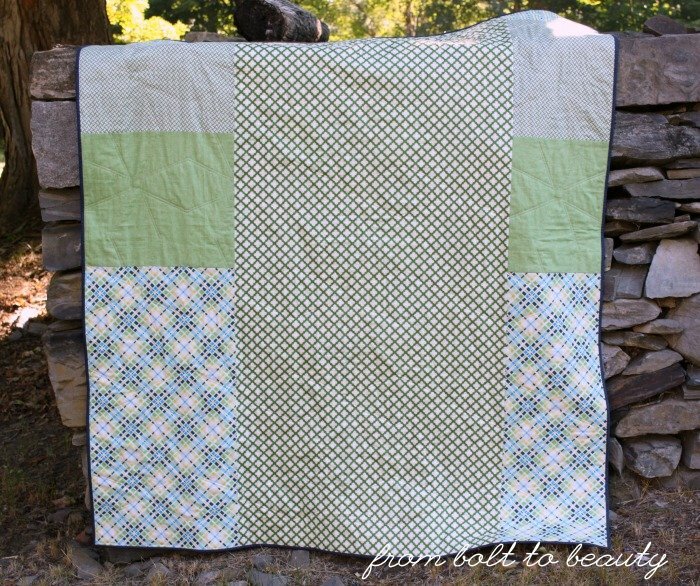 The second project is a quickie whole-cloth baby quilt that uses some Heather Ross fabric from Nursery Versery and Briar Rose. Again, my approach was all Nancy. Although I routinely avoid marking my projects prior to quilting, this is the first time I’ve used the fabric design (as opposed to the seam lines) to plot my quilting. The problem with that approach is, over time, the grain of a fabric can warp as it sits on the bolt, which is what happened with my cut of Nursery Versery. 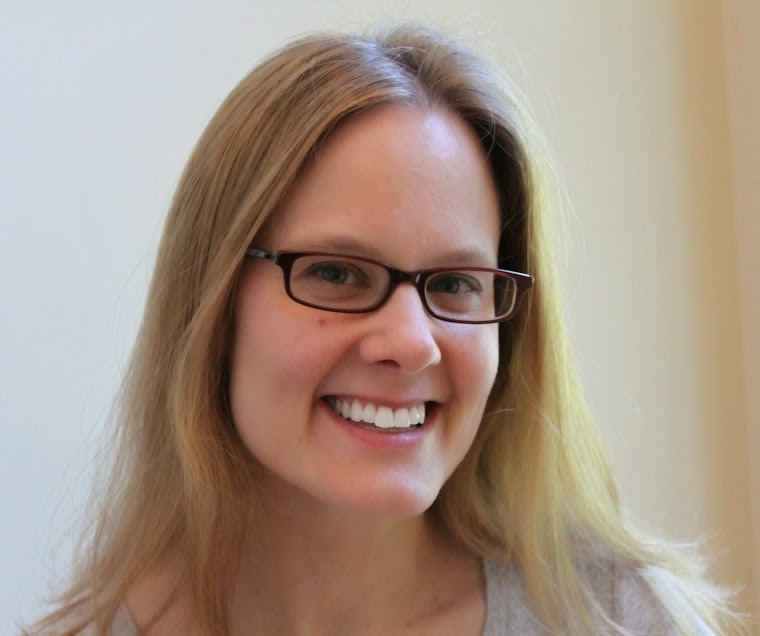 Heather Ross describes the process of remedying this problem as “trueing the fabric” in her book Weekend Sewing. I’ve never had luck with trueing my fabric; once a fabric design is warped, it stays that way. So instead of quilting horizontal and vertical lines as Nancy did, which I thought could reveal my fabric’s imperfections, I sewed diagonal lines. They’re more forgiving. Now that the project is quilted and bound, I’m barely aware of the wonkiness. 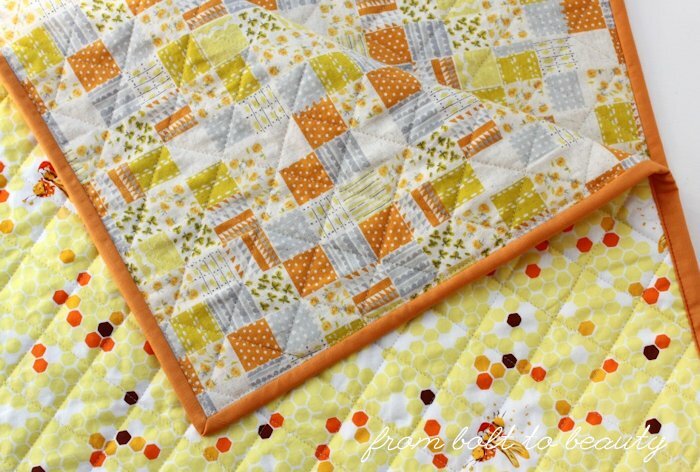 I bound this baby quilt in Michael Miller’s Cotton Couture in orange. I’ve used Cotton Couture plenty of times, just never for binding. Its soft hand makes for a happier binding experience. 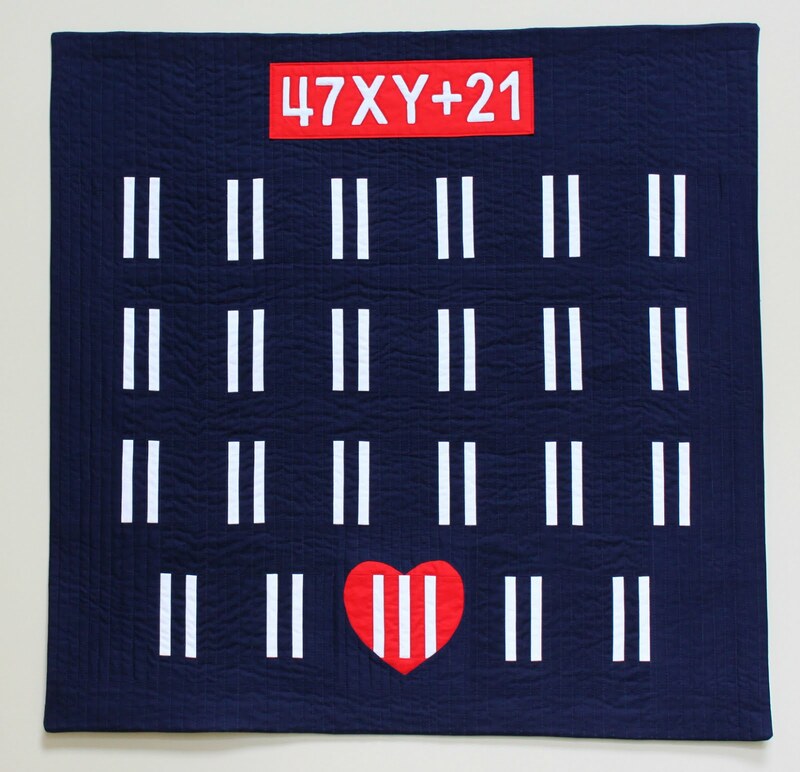 OK, I’ll admit it: Nancy is a quilting crush of mine. I opted not to try to get into one of her QuiltCon 2017 classes and am already kicking myself for it. Whose work have you been turning to for inspiration—or flat-out stealing!—lately? I’ve been doing a lot of paper piecing lately, with successes and seam ripping along the way. My latest finish? 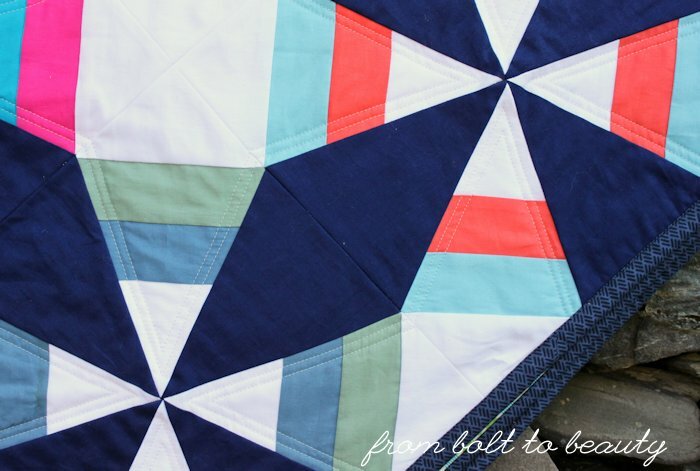 This Dutch Windmill quilt, designed by Red Delicious Life, blocks sewn by NHMQG members, and pieced, quilted, and bound by me. All it needs is an afternoon at the spa, and I’ll send it off to an appreciated employee of Boston Children’s Hospital who serves the Down syndrome community. My designated quilt holder is out of town, so an old stone wall did the job. I’m thrilled with how this project turned out. I provided guild members with the navy and white fabric, and they could use whatever solid scraps they had on hand to finish off their blocks. The bold, graphic design and the anything-goes color scheme create a quilt suited, I think, for anyone with a modern aesthetic. 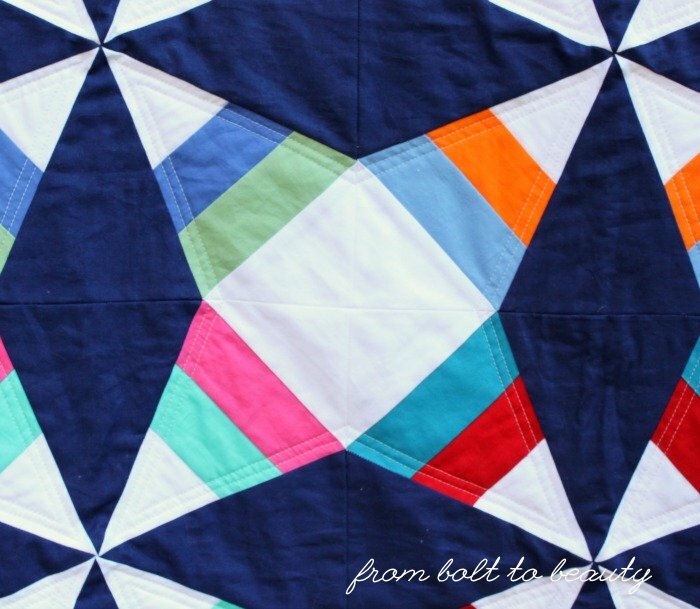 It was fun to see different colors juxtaposed in the quilt. I love the combination of dusty blue, sage green, pale aqua, and coral-y carrot here. Could it be the palette for a future quilt? 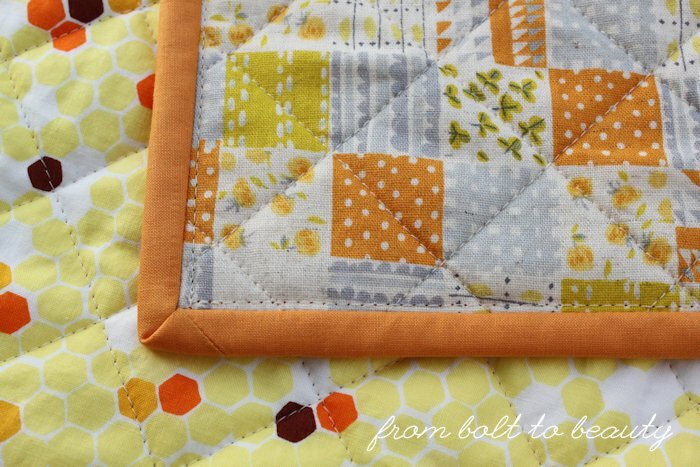 I’m a straight-line quilter, and settling on an approach to the quilting was difficult. There’s quite a bit of bulk at the ends of the navy diamonds, and I wasn’t sure my machine could work through it neatly. I chose to avoid those intersections and sew with my regular foot along the seam lines in the white/striped sections. I had lots of threads to bury when it was all said and done, but this plan was worth the extra work. Two lines of quilting along these seams did the trick. I thought of the back as a foil to all of the solids in the top. I chose a color that appears in the top—green—and found fabric in my stash to create a mostly monochromatic back. I like it. This quilt needed something with personality on the flip side. I used my usual approach to piecing the back. It’s not just me who has the paper-piecing bug these days. I spotted a paper-piecing finish over at Anja Quilts recently, and Never Just Jennifer has made good progress on her version of Icy Waters. How about you? 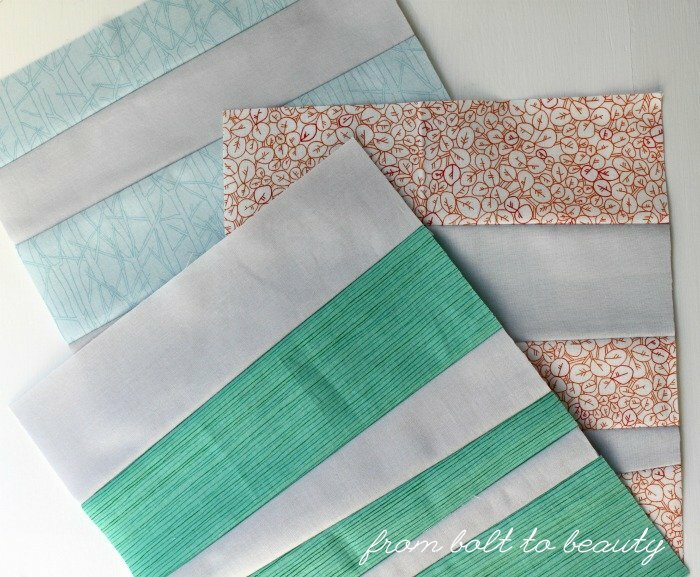 Have you been sewing through fabric and paper at your machine lately?